I like that thought..."When you want to give up, remember why you started". Agree... We are truly happy when there is sync between what we believe in and what we do. Way to go, Chicky! Another very wise post. I have enjoyed your posts.They have reminded and reinforced many topics that I know about but have forgotten or pushed aside. 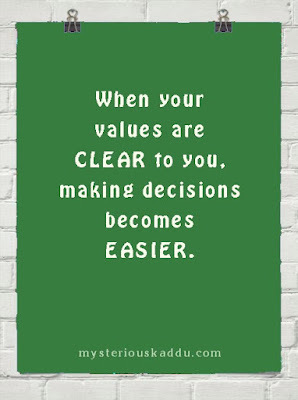 Values is a good one. If we don't know our values, it is difficult to have goals and direction. Thanks for the reminder to focus on my values as often they get hazy in the busyness of daily life. I often feel scattered but in a good way because I have many interests and can't choose just one. My values are to live simply with love and creativity focusing less on material things and more on experiences and relationships. I feel more content when I do that. Happy A to Zing. We're almost done! Woohooo! Now onto my W post which I have yet to write! A thought provoking post. Very true we should live our life according to our values not the values of others. I like the idea that we must have our own set of values, than those borrowed from others, say, our parents. That said, the post made me think... I'll be pondering over it for a while. I completely agree with you on your thought that everyone should have their own values. One cannot adapt values blindly. They can definitely tweak those values to adapt them as per their background and personality. Love the crux of this post. Values are so important as they make us or break us!! Its also important to align with peeps with a value system that matched yours for better compatibility! All three points are true...values do keep us going when the going gets tough... I am glad you added values to the cause of happiness list. I read somewhere that writing out a personal values statement and pinning it up where you can see it regularly can help guide you on your most fulfilling path. Your post certainly reinforces that concept! I've really enjoyed your A to Z posts -- and your e-book -- and appreciate your visits/comments on my blog! These sorts of connections among bloggers are something we all value -- please stop back during the year, or at least on May 5 when my A to Z summary post goes up. Bye for now and thanks for being an inspiration! Exactly Shilpa, and it is so important to find out what truly works for us. This post was an eye opener for me, Cathy. I don't think I realized till now what really were my values. Actually, that's the reason I have been lagging behind in this series. It's a personal learning experience for me. I've chosen topics that I wanted to reflect upon anyway, for getting my own act together. Thank you for sticking around and encouraging me along the way. I will complete the series soon. Hey that's what I've been thinking of doing, Molly! Making a list of my top personal values and pinning them somewhere where I can see them daily! That's true, Hilary. We do need to think for ourselves. Thank you, Molly. I still have posts to complete in this series. So I'll visit those letters on your blog when I get around to them. Hi Shirley. Yes, it was fun, but super hectic. Glad to connect with you during the challenge. Values and principles make our character. My values are very much in line with my parents as it came just naturally to me. Although I may not be as disciplined as them, we have similar beliefs. That can sure avoid a lot of conflicts, Raji. Good for you guys! I once heard that when someone doesn't like you, what they are really not liking is all of the people who are your friends and family, the people who have molded and guided you into the person you've become. I've definitely been experiencing some struggles with my family as I've grown and changed and my values have altered over time. Hmmmm yes... that can create a bit of a struggle with our close ones. Majority of human beings don't like change.It tends to alienate us from our comfort zone.